The Haryana State Election Commission has directed the district electoral officers to prepare voters’ lists of all gram panchayats, gram samitis and zila parishads in the state. The Haryana Pradesh Congress Committee deputy spokesperson, Dr Pradeep Chauhan, said here today that the Congress would launch a major agitation within 10 days if compensation was not allocated to the flood-hit residents of Ambala Cantonment and Ambala City. The Haryana Governor, Dr A.R. Kidwai, has said the developing countries have a great role to play in the upcoming WTO regime. He maintained that countries like India and China would have a good scope as these could produce quality goods at competitive prices for the global market. 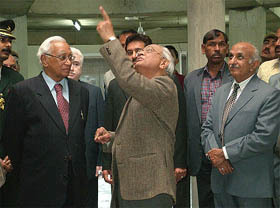 Guru Jambeshwar University (GJU) Vice- Chancellor Vishnu Bhagwan (centre) explains a point to Haryana Governor A.R. Kidwai (left), while HAU Vice- Chancellor M.K. Miglani (right) looks on, at the GJU in Hisar on Wednesday. Aashish, who is fighting a legal battle to resettle in his village, Jaundhi, near here, after living in exile with his wife for four years today accused the Sarpanch of the elected village panchayat of surreptitiously opposing his resettlement. The local wing of the National Highway Authority of India has issued hundreds of unauthorised passes to government officials and influential political leaders for use while travelling in their private vehicles in the district, facilitating their free passage through the toll barrier situated on the national highway. Farmers of the Chhachhrouli block today forced open gates of the two channels of the Western Yamuna Canal supplying water to their fields, at the Tajewala head water works, 35 km from here. The water supply was reportedly stopped yesterday. Life in Jakholi village of the district has returned to normal after the Sarvjatiya panchayat withdrew its call of social boycott of members of the Lohan caste at the intervention of Superintendent of police Ranbir Sharma. The Jat heartland’s first international farm tourist Resort has come into existence at Samargopalpur village near here. The farm resort has been set up under a scheme launched by the Haryana Tourism Corporation in collaboration with progressive farmers of the state to attract foreign tourists wanting to have a feel of rural life in India. The Health Department of Haryana has implemented a scheme for the welfare of pregnant women to reduce the infant and mother mortality rates. Under this scheme, normal and Caesarian deliveries will be conducted free of cost in all government health institutions and hospitals in the state. The Haryana Health Department has started a new scheme for the welfare of pregnant women with a view to bringing about a decline in the infant mortality rate and mother mortality rate. Under the scheme, child deliveries, including caesarian deliveries, will be conducted free of cost in all government health institutions in the state. The appointment of Mr Randeep Surjewala as the working president of the Haryana Pradesh Congress Committee (HPCC) has been hailed by the Congress activists in Ambala. The High Court on Wednesday directed the Haryana Government to file reply to the allegations levelled in the PIL filed by Dr B. Singh, seeking fixing of responsibility on the officers who allowed pubic land to be encroached upon by anti-social elements. The Haryana Public Service Commission has declared the results of HCS-main (written) examination, 2004, held by the commission in August. The Sate Vigilance Bureau has arrested a clerk of the housing board at Ambala City here today for taking a bribe of Rs 1,000 from a resident of the Housing Board Colony. The panchayat of Khanak village which met the Superintendent of Police Arshinder Singh Chawla today has sought action against the in-laws of two sisters of Tigrana village for harassing the brides for dowry and getting the uterus of one of them removed. A minor boy, Parveen, died as a bullet hit him during firing by some persons who were celebrating “ghurchari” (a marriage-related function) at Mahotti village here last night. Jarif (60) of Uttar Pradesh was killed when the truck he was travelling collided with a stationary truck yesterday. Four other persons in the truck, including the driver, were injured. He appealed to villagers to bring the INLD to power in the state again. Coming down heavily upon the Congress, he said much to the discomfort of the public the Centre had steeply hiked the price of household items. The state government would soon issue a notification to recruit Punjabi teachers to promote the language, he added. Mr Chautala said the state government was committed to promoting the Punjabi and it had given second language status to the language. He stressed the need to promote the rich literature of Punjabi in the state. To promote Punjabi the government would post a teacher in each government school, he said. The Chief Minister also inaugurated historical Bhadra Talab at Sirsa. The administration has revamped the once neglected religious site with installing fountains, trees and doing landscaping there. He also attended a function organised by the district Red Cross Society and distributed 2,000 blankets among the poor at Police Lines. The Haryana Chief Minister, Mr Om Prakash Chautala, said today that the state government had been laying special emphasis on the technical education of children so that the next generation did not have to run after government jobs. Mr Chautala said this after inaugurating the newly constructed building of the Government College for Women here. The new building of the college has been completed at a cost of Rs 5.75 crore. The Inspector General of Police, Hisar Range, Mr Resham Singh, the Deputy Commissioner, Mr Mahtab Singh Sehrawat, the SP, Mr Saurabh Singh, the MLA, Ms Swatantra Bala Chowdhary and the INLD (Women Wing) president Ms Krishana Poonia were present on the occasion. The Chief Minister said his government had taken special measures to encourage technical education in the state and many new job oriented courses had been introduced. He emphasised the need for education of girls and said that an educated girl could improve the lot of two families that of her father as well as that of her husband. Mr Chautala also laid the foundation stone of a girl’s hostel near the college building. The hostel would be completed at a cost of Rs 1.25 crore. He also laid the foundation stone of an officer’s colony near the mini-secretariat. The direction assumes significance in view of Governor A.R. Kidwai’s decision yesterday to give assent to three Bills pertaining to advancing elections of Panchayati Raj institutions and urban local bodies by 120 days before completion of terms. The Haryana Assembly had earlier passed a Bill making it mandatory for the state Election Commission to consult the state government before announcing dates for elections of panchayats and urban local bodies. Official sources told TNS that the state government would like the panchayat elections to be held sometime in the middle of January. The state government is working on the assumption that Assembly elections will take place in the state either in the last week of February or beginning of March. A notification, issued by the commission today, stated that from December 8 to 10, voters’ lists of all wards of zila parishads, panchayat samitis and gram panchayats would be prepared on the basis of Assembly electoral rolls published on February 23, 2004, with reference to qualifying date as January 1, 2004. The draft publication of lists pertaining to all wards of the gram panchayats, panchayat samitis and zila parishads would be completed upto December 11. The last date for receipt of claims and objections would be December 15 and for disposal of such claims and objections by the district electoral officer (Panchayats) would be December 18. The final voters’ list would be published by December 27. The state Election Commission has also directed that the draft voters’ lists should be in conformity with the electoral rolls of the Assembly constituency published on February 23, 2004. Only such person should be registered as voter in the draft voters’ list whose name appeared in the electoral rolls of the Assembly constituency. Significantly, the state government had on October 14 amended the rules of Panchayati Raj elections to hasten the process of elections. Talking to mediapersons, Dr Chauhan said the Chautala government had ignored urban areas while giving compensation to the flood-hit. “The government has discriminated against urban areas that faced the brunt of the flood in August,” he said. He demanded that the government must provide at least Rs 50 crore as compensation to the flood-hit in the urban areas. “Even the compensation of Rs 41 lakh to the villagers is a small amount as compared to the devastation,” he said. He said the district administration had failed to carry out effective relief work in flood-hit areas. “Thousands of people lost their belongings in floods. Many houses were damaged besides loss of livestock. Traders and businessmen were badly affected. Although Haryana Chief Minister Om Prakash Chautala had visited the Ambala Cantonment Anaj Mandi, he left with only hollow assurances,” he said. He said he had led a delegation to the Commissioner and they had submitted application seeking help. “We even observed a symbolic day-long fast on Gandhi Jayanti. The government seems to have turned a deaf ear to our demand,” he said. Criticising Ambala Cantonment MLA Anil Vij, he said the MLA had failed to convincingly raise the demand for compensation for the flood-hit. To a query, Dr Chauhan said the Central intervention could take place only when the state government sought its help. “The state government did not declare Ambala Cantonment and its adjoining areas as flood-affected and it did not even seek financial package,” he said. Dr Kidwai was addressing the faculty and staff members of Guru Jambeshwar University (GJU) here today. He said the future of the nation lay in education and the 21st century was marked by the evolution of a knowledge-based society. The Governor emphasised that the progress of a nation depended on how well it utilised the scientific advancements. He said history was replete with examples of civilisations going down due to their non-compatibility with technology. Dr Kidwai, who is also the Chancellor of the university, observed that the youth who rose to the challenge, would have no dearth of employment in future. He asserted that owing to its biodiversity and rich natural wealth, the country had a great potential to emerge as the world leader in the fields of agricultural biotechnology and medicine. Dr Kidwai pointed out that Indian professionals were working in responsible positions in several prestigious organisations all over the world. The GJU Vice-Chancellor, Mr Vishnu Bhagwan, gave a brief account of the objectives and achievements of the university. Mr Balbir Singh Malik, Deputy Commissioner, Mr Resham Singh, IGP, Mr Attar Singh Ahlawat, SP, Mr M.K. Miglani, Vice-Chancellor of Haryana Agricultural University, and Mr Devender Kasania, Registrar of GJU, were also present. Dr Jyotsana, in charge of the Applied Psychology Department of the GJU, introduced the visiting dignitary and proposed the vote of thanks. Earlier, the Governor inaugurated a teaching block of the university. The block has been constructed at a cost of Rs 1.35 crore. He also laid the foundation stone of the mechanical engineering workshop of the university. The accusation was made before the Additional Deputy Commissioner, Ms Suprabha Dahiya, who had summoned him to record his statement. He said in the statement that the Sarpanch, Ms Pushpa Devi, had organised a panchayat on December 2 in the village which decided to challenge his petition in the court seeking his rehabilitation and banned all kinds of celebrations till “justice was done to the village community”. He also alleged that according to the decision of that panchayat she was collecting Rs 50 per household to meet legal expenses of challenging his petition. However, Ms Pushpa Devi, in her statement denied the charges and stated that she had no objection to the exiled couple resettling in the village. She denied any information about the activities of the khap panchayats opposing the couple’s rehabilitation. Ms Pushpa Devi, who had resigned in the wake of the controversy, pleaded that her resignation be accepted expeditiously and if that did not happen, she would forward a copy to the Chief Minister directly. However, outside the ADC’s court, her husband Mr Vinod Kumar, admitted that he had organised the panchayat on December 2 which derailed the rehabilitation process of the exiled couple. He said he was determined to oppose Aashish’s petition in the Punjab and Haryana High Court. After recording his statement, Aashish told The Tribune that he was even prepared to settle outside the village phirni ( the boundary demarcating the residential area) as dictated by an earlier khap panchayat but in that case the panchayat should build a house for him since he did not have the required funds. He said he was living in his ancestral house for the past few days because of the security personnel provided to him by the district administration. He feared a threat to his life if the security was withdrawn. Aashish also alleged that villagers had removed bricks from the street leading to his house to harass him “at the behest of the Sarpanch”. The ADC refused to comment saying she could not disclose the statements made by any of those summoned by her. Aashish and Darshana were married in 1998. While Aashish comes from a Dagar family, Darshana’s gotra is Gehlawat. Dagars are in minority in the village. Two years after their marriage, a khap panchayat was convened, which exiled them from the village for life. Aashish’s family was ostracised for two years. The couple had a one-year-old son at the time. Since then the couple had been living in a Delhi suburb. Aashish’s father died during this period and he had to be escorted to the village by the police to perform the last rites. The couple had returned to the village on Divali eve after a panchayat held under the supervision of the Superintendent of Police last month decided to allow them to live outside the village phirni. They were later allowed to live in their ancestral house in the village. However, another panchayat chaired by the sarpanch’s husband, Mr Vinod Kumar, on December 2 put the clock back by deciding to challenge the couple’s petition and banning celebrations. The local wing of the National Highway Authority of India (NHAI) has issued hundreds of unauthorised passes to government officials and influential political leaders for use while travelling in their private vehicles in the district, facilitating their free passage through the toll barrier situated on the national highway. Senior authorities of the NHAI at New Delhi and the local police have initiated separate inquiries into the matter. When local District Magistrate R.S. Doon was asked whether unauthorised passes for free passage through the toll barrier situated on the national highway were in circulation in the city, he admitted that some senior officials of the NHAI came to his office last month to give him such passes for government officials and other influential people for use while travelling in their private vehicles. However, I refused to accept such favour and warned them not to indulge in such illegal acts”, he said. Meanwhile, it came to the notice of The Tribune that certain police officials had accepted this favour and later circulated hundreds of such free passes, bearing photograph of Taj Mahal and stamps of the local city police station, among their near and dear ones along with influential people of the area. A driver of a local influential personality revealed that his boss had got the free pass from the police. A senior police official admitted that such free passes were given by the local NHAI branch to them for use while travelling in their private vehicles. Meanwhile, the Deputy Superintendent of Police (headquarter), Mr Surinder Pal Singh, issued a notice to the SHO of the city police station today and sought a written explanation in this regard. He said a thorough inquiry would be conducted into the circulation of such unauthorised passes in the district and the alleged role of the police personnel in it. However, Mr Rajesh Kaushik, manager of the toll barrier, plainly refused that any such illegal free passes were circulated among officials and influential personalities. The Tribune also tried to contact the Deputy General Manager (DGM) of the NHAI on telephone at his office in Ambala but he was not available for comments. A spokesman of the NHAI in Delhi said there was no such provision to issue free passes anywhere in the country. Only monthly paid passes were being issued to those people who were living close to the toll barrier within an area of certain kilometers (as per the norms). He said the matter would be inquired and action taken accordingly. Farmers of the Chhachhrouli block today forced open gates of the two channels of the Western Yamuna Canal (WYC) supplying water to their fields, at the Tajewala head water works, 35 km from here. The water supply was reportedly stopped yesterday. On December 2 also, farmers from 40 villages of the block had forced open the channels. A delegation of the farmers later met the Deputy Commissioner, Superintending Engineer (Irrigation Department) and the Sub-Divisional Magistrate. The farmers have been told, said sources, that the regular supply to the block could not be made until the water level in the canal reaches 2,500 cusecs (the water level in the canal has reduced significantly). The farmers have been warned against taking the law into their hands. No senior official of the Irrigation Department could be contacted for comments. The Irrigation Department had stopped the supply of water to the block yesterday (after the farmers had forcefully opened the channel gates on December 2). The farmers held a meeting last evening and reassembled at the New Grain Market, Khizrabad, this morning. Later, they reached Tajewala and opened the gates of the two channels. It is to be mentioned here that the area was getting daily water supply ever since the canal was dug in 1872. However, citing change in rules, the Irrigation Department regulated the water supply and stopped the supply from the two channels in the last week of November. The block has now been connected with the Annta Regulator Group. The Yamuna Command Area has been divided in four zones – Annta, Delhi, Sunderpur and Butana. Each group gets irrigation water for eight days and next water supply is made after 24 days. Mr Rajiv Walia, sarpanch of Khizrabad, said on earlier occasion the area had been getting water supply even if the water level in the canal was around 1,000 cusecs. The farmers have reportedly made a request to the officials to whom they met today not to stop the supply but instead reduce the supply ratio. Farmers say that tubewells could not be bored in the area because of the land conditions and the fields must be irrigated at least twice a week. The SP had called members of the Lohan caste and other residents of the village, including Mr Mani Ram Kadiyan, whose grandson Satyajeet was engaged to daughter of Partap Singh Lohan of Ramra Bhain village in Jind district and talked to them. He prevailed upon members of both castes and other villagers to forget the past and live with peace in the village . His advice was accepted by all those present at this meeting, and Mani Ram Kadiyan and others agreed to with draw the boycott call . The village became tense in October when the Sarvjatiya panchayat gave a call for social boycott of Lohans living in Jakholi village when the Lohan Khap Panchayat asked Partap Singh Lohan to break the engagement of his daughter with a Kadiyan boy of Jakholi. They had taken the decision following a convention that any Lohan will not marry his daughter in a village where Lohans were already living . A number of meetings of Lohans were held but Partap Singh refused to obey the diktat of the Lohan panchayat and insisted that he would marry his daughter to Satyajeet Kadiyan . Following this , Lohans had decided to hold a Panchayat on December 5 to discuss the situation , However, this meeting was postponed, which ultimately paved the way for the withdrawal of the social boycott. Mr Mani Ram Kadiyan had pleaded with members of Lohan Khap not to follow old conventions and mend their stand in view of the changing social situation. He took the plea that if this practice was followed, it would create hurdles in the way of finding suitable matches in villages. When Lohans remained adamant on their stand and opposed the relationship between the family of Partap Singh and Mani Ram Kadiyan , a Sarvjatiya Panchayat held at Jakholi in October boycotted the Lohan families living there as they were held responsible for instigating their Khap members . As a result of the boycott, most of the villagers living in one Patti had stopped their social and business dealings with Lohan families and despite no major incident taking place there, tension continued to prevail in the village since October. The Jat heartland’s first international farm tourist Resort has come into existence at Samargopalpur village near here. The farm resort has been set up under a scheme launched by the Haryana Tourism Corporation (HTC) in collaboration with progressive farmers of the state to attract foreign tourists wanting to have a feel of rural life in India. Spread over 10.5 acres, the resort has 15 rooms, of which nine are rented out to foreign tourists. All these rooms have modern European-style toilets, but the rooms have a rural ambience. The drapery and the bedcovers have rural motifs. These are procured from rural artisans of neighbouring villages. The rest of the rooms are used by the owners’ families. Food is prepared by the family members, mostly women. Though as a matter of rule, Haryanvi food is served, the owners arrange for continental food from local restaurants should the guests so desire. However, the HTC and the owners insist on in-house to give the guests a homely feeling. “Chapattis” are specially prepared on a chulha and not LPG stoves to complete the traditional setting. The only cooking medium allowed is desi ghee produced at the farm itself. The owner Ms Usha Parmar, who is also a member of the Zila Parishad, told The Tribune today that “karhi” and “raita” are favourites with the guests, especially the Japanese. The first two families to stay at the resort were both Japanese farmers. “They liked the karhi with desi ghee flavour so much that they asked me for its recipe”, said Ms Parmar. According a circular issued by the department, female patients would be provided medicines and blood free of cost under this scheme, if required, and it would not be necessary to arrange replacement of blood. As many as 68 ambulances have been provided for referring delivery cases to various referral health institutions in the state. A sector investment programme supported by the European Commission was also being implemented in the state for improvement of the health care delivery system. Under the programme, special attention was being paid to the health of women and children. Financial powers had also been decentralised at the district level to achieve this objective. District health societies had been constituted, which would retain the user charges in their respective institutions. The amount so collected would be used for the maintenance of equipment and making provision for essential medicines in the health institutions. Besides, a computerised inventory-monitoring system of medicines had been introduced in the health institutions and the use or prescription of generic medicines had been made mandatory for the benefit of the poor patients. The supply of furniture and instruments to the health institutions had also been increased for strengthening their infrastructure. The information technology system had already been introduced in the Health Department to improve efficiency and to bring about transparency. The State headquarters and all district headquarters had been computerised. Meanwhile, modern equipment worth Rs 3 crore was being provided in the all hospitals and health institutions of the state, said a senior official of the department. He said during the past five years, as many as 52 buildings of health institutions had been inaugurated, which included seven hospitals, seven community centres, 26 primary health centres, six urban dispensaries, two logistic stores, two CT scan centres, a training centre, a casualty ward and a trauma centre at Ambala city. The foundation stones of 29 buildings had been laid during the same period. The buildings included one blood bank, three hospitals, one trauma centre, six community health centres and 18 primary health centres, he added. While disclosing this here today, the Director-General of Health Service, Dr B.S. Dahiya, said under the scheme such female patients would be provided free medicines and blood, if required. As many as 68 ambulances had been provided for referring the delivery cases to various referral health institutions in the state, he added. Mr M.L. Sehgal, general secretary of the mahasangh, said here today that the talks of their representatives with senior administrative officers were held in the presence of the Finance Minister, Prof Sampat Singh, in Chandigarh last evening. The employee leader said they were assured that efforts were being made to meet their demands. He said the Chief Minister had agreed to attend a meeting of the employees called by the mahasangh at Yamunanagar on December 12 when he would make a formal announcement in this regard. The Haryana Pradesh Youth Congress Committee vice-president, Mr Chetan Chauhan, Mr Randhir Rana and Mr Parminder Pari welcomed the appointment of Mr Surjewala. District Congress Committee president Ashok Jain said the appointment of Mr Surjewala was a gift from Congress president Sonia Gandhi to Haryana. The petitioner has also stated that hundreds of acres of government land in Punjab, Haryana and Chandigarh have been encroached upon by these elements, all with the connivance of officials of HUDA, PUDA and other such agencies. Sometime back, the Bench had been informed by counsel for HUDA that over 1400 acres of government land has been encroached upon while litigation has yet to be initiated regarding 300 acres of such land. Of the 1400 acres, over 800 acres land have been encroached upon in Gurgaon alone, while the figure for Faridabad is over 250 acres. Today, during hearing, the petitioner stated that HUDA had been suffering a loss of over Rs 200 crore every year due to these encroachments. He also alleged that many HUDA employees have also encroached upon the government land in Panchkula. This, he added, shows that HUDA has been facilitating encroachment of its land. The Bench headed by Chief Justice Mr Justice B.K. Roy also asked the Punjab Government and the Chandigarh Administration to submit their reports on encroachments on government land. The hearing will now resume on January 21. Sometime back, the Bench had directed the authorities to provide lists of such lands, the total land acquired, compensation paid to the original owners, possession taken, total area encroached upon and what action has been taken by them to evict the encroachers. While disclosing this here today, a spokesman of the commission said the result would be subject to orders/decision of the Supreme Court in SLP (C) No.CC11537/2004 and High Court orders in CWP No.10417/2004 and CWP No.10353/2004. The spokesman said the candidates who had opted for the post of Deputy Superintendent of Police and were eligible(age-wise) should report for physical measurements at Haryana Tourism, Red Bishop, Sector 1, Panchkula, at 10 a.m. on December 11, 2004. The interview would start from December 13, 2004, and the date of interview would be intimated to the candidates separately, he added. According to information, Raj Kumar Gupta of Housing Board Colony had filed a complaint with the DIG, Vigilance Bureau, in Ambala against the clerk, alleging that he had been demanding Rs 1,000 from him as bribe for issuing an NOC. Mr Ahlawat constituted a raiding party under the supervision of Inspector Suresh Kumar. Today when the clerk, Sham Kumar reached the residence of Raj Kumar to collect the amount the raiding party nabbed the clerk. A case under the Prevention of Corruption Act was registered against the clerk in this regard. Those who met the SP included father of the victims Balbir Singh. Balbir Singh said he had married his two daughters Vidya and Mukesh with Nandu and Sandeep respectively, sons of Om Prakash of Tigrana village in May 1999. He alleged that in-laws and the husbands started harassing his daughters for more dowry soon after marriage. He further alleged that the in-laws had beaten his daughters several times and they had removed uterus of one of his daughter. He said that no action had been taken on his complaint submitted to the SP earlier. He alleged the police was not pursuing the case seriously and protecting the accused. The SP has assured of stern action against the accused. While an FIR under Section 304 (death by negligence), IPC, was registered against unidentified persons at Samalkha police station, no arrest has been made till the filing of this report. Parveen was watching the “ghurchari” of Dariya, son of Krishan, in the village when a bullet hit him. He was rushed to hospital but was declared brought dead. His body was sent to the Panipat Civil Hospital for a post-mortem examination. Talking to The Tribune, Ram Chander, father of the deceased, alleged that several drunken persons were firing in the air to celebrate the “ghurchari”. He demanded that the culprits should be arrested at the earliest. It could not be known with whose fire Parveen was killed. He was just 15. Police sources said due to heavy fog, the driver could not see the stationary truck and the accident took place. The injured are Mustkin, Shahid, Rejwan and Habid. All the five were going to buy cattle from Punjab. In another incident, a woman and her neighbour sustained burn injuries when the stove on which the former was boiling milk burst yesterday.